1.1.5.4 Action can be canceled? The Level 4 structure is the 'child structure' of the Level 3 one. In order to join a religion, a player must be initiated by a Priest. A priest can find the link to initiate a player in the page Characters present in Region or on the character public profile. Character that will be Initiated must be idle. Character that will be Initiated must be properly dressed. Initiation will block for some time both the Initiated player and the Priest. At least one Golden Basin in the inventory with quality >= 25%. The Faith Level stat of the ‘Initiated’ player will be set to a start value of 30%. A player will be able to raise his faith level by donating some coins to the Church. To be able to use private functions, the Structure owner will need to be properly dressed and hold specific tools in order to access the Religious Structure and perform duties. The character will need also a Faith Point contribution of 220 Faith Points. The equipment will be consumed every time a function is executed. For more details check here. Some options can be configured in the Manage page. It is possible to configure a description that will be shown in the Info page. BB Codes are supported. It is possible to configure a informatinal message that will be shown in the Info page. BB Codes are supported. 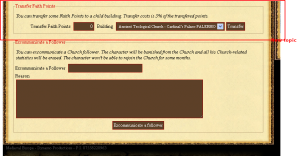 It is possible to configure if the cleric is available or not to officiate. If the not available option is set, cleric will be able to do other task (craft, move etc). A new page will be created where the owner will be able to set the price of the items that can be sold in that structure. The [multiplier factor] is decided by the Bishop and will be applied to all the substructures controlled by him and can go from 1.5 to 2. This page was last modified on 23 June 2018, at 14:51.